Keep all your veggies raw and crunchy! The more colours on your plate, the better. Different coloured vegetables have different types of nutrients and vitamins in them. Bright orange and deep green vegetables are supposed to be the healthiest. Aim for 5-8 types of veggies. It makes every bite of your salad different! Consider adding a fruit to the salad for a hint of natural sweetness. I love slicing a fresh, juicy orange into my salad. Try to choose something that will go well with your dressing. Keep your salad dairy free and vegan by omitting the cheese. This salad can be eaten on its own or as a side dish. Either way, it’s a definite winner in my kitchen! 1. Bring a large pot of water to a boil. Add the quinoa and reduce the heat to medium low. 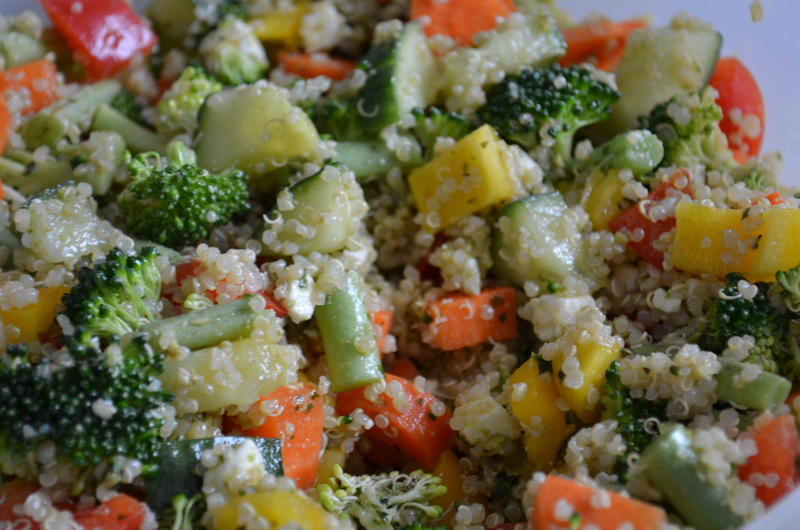 If you wish to cook the quinoa in vegetable broth for extra flavour, do so. Once the quinoa is cooked, about 20 minutes, drain any additional water and allow the grains to cool to room temperature. 2. Wash all of your vegetables. Peel your carrots. Cut all veggies into 1-inch pieces. 3. Cut your fresh feta into small cubes, about 1/4-inch. The feta has a strong flavour so you don’t need very much. 4. Combine all of your ingredients in a large bowl and mix. Add the pesto and stir to coat the grains. Season with salt and pepper as needed and enjoy! This entry was posted in Dairy Free, Entrées, Grains, Quick Meals, Salads, Sides, Vegan, Vegetables, Vegetarian and tagged broccoli, carrots, cucumber, easy, feta, fresh, green beans, lunch, peppers, quick, quinoa, salad, vegan, vegetables, vegetarian by laratboulos. Bookmark the permalink.